Dragons of Tarkir has no shortage of awesome cards. Some of these are build-around-me additions to a Cube, others will make waves in Tiny Leaders, and several seem to be designed for the kitchen table crowd. I am going to talk about a few of these, along with the price I’m comfortable getting in at. If something blows up in Standard or other Constructed format, my pricing will undoubtedly be off. Anafenza, Kin-Tree Spirit – Sure, she’s amazing in Tiny Leaders, but she’s also an enabler in all sorts of White Weenie strategies. Her mana cost is probably the biggest thing holding her back, as it’s not easy to get double white on turn two. Pick her up for $1 or less. Hidden Dragonslayer – The rule about Morphs in EDH or Cube was this: it’s either Exalted Angel or Willbender. Khans block has given us some amazing morphs, and this cycle of cheap, powerful Megamorphs might be among the best of all. Singleton formats are where you really want flexibility, and you have a range of useful things to do here. That said, I think this is another dollar rare. Profound Journey – I had Obzedat’s Aid in my Kaalia deck for the longest time, and it’s…serviceable. It has been cut, and while this is potentially twice as powerful, it costs even more. What’s really going to bother you is how often you spend seven mana and get back something that costs a lot less. Bulk rare. Radiant Purge – I think this might be one of the sneakier cards of the set. Two mana for an instant-speed exile effect is not to be undervalued. It’s true that it would be better if it said “Exile target multicolored permanent” but we just got Utter End for such universal applications. I think this will hold a price due to being a popular sideboard card in Standard, so around $2. Secure the Wastes – Believe it or not, while we’ve had numerous versions of this effect before, we’ve never had one this cheap, especially as an instant! This is an auto-include in any EDH token strategy, and I think it’s good enough for Cube too. I’ll be especially interested in foils around four or five dollars. Clone Legion – In case you forgot, Wizards R & D plays a lot of EDH. This is a neat way to either win more on your own awesome board, or play catch-up with just one card. This is not a Standard card, this is absolutely a haymaker, battlecruiser, giant Commander effect. This is going to be better than you think it is, no matter if you’re ahead, behind, or at parity. It’s not going to be bulk, but I’ll be surprised if it’s ever more than $2 in nonfoil. Living Lore – Some people are going to try and make this good. Don’t be one of those people. Bulkiest of bulk, until some weird Legacy combo pops up. Stratus Dancer – I think this card is good enough for Standard, though to be honest, I’m not someone who plays a lot of that. Nonetheless, every mode on this card seems good. A 2/1 flyer for two is a good starting point, and if you have the time and mana, holding up an uncounterable counterspell for their sweeper is pretty amazing. I like this a lot in Cube and Commander too. This might be the priciest of the cycle, at around $3. Hedonist’s Trove – This basically gives you a second library to play cards from. There’s a lot to be said for effects like this, but the problem is that you have to do a lot of work to fill their graveyard. I love it, but I’m not going to try and play it. Bulk. Blood-Chin Fanatic – Kresh the Bloodbraided has a new best friend. So does Hamletback Goliath. The pieces are there on a decent body for the price, but this will struggle to be more than a dollar or two. Damnable Pact – There is a lot of fun to be had with these two modes. With a little mana, it’s a way to get a couple of cards. With lots of mana, it’s the finisher against people with low life or small libraries. It’s a surprisingly versatile spell, and should be considered in most decks. The card I’d measure it against is Diabolic Revelation, except that Revelation is a terrible card at less than seven, whereas there’s plenty of games I’d be happy to cast this for two or three. I think this will have a nice home around $2. Virulent Plague – Hear me out. You should be giving serious consideration to playing this in most of your Commander/Tiny Leaders games. There’s very few tokens that can survive this without help, and mostly those are 3/3 Beasts and 4/4 Angels, which need to be cut down in size anyway. This is also an intriguing sideboard card in Modern, at least until Splinter Twin gets banned. I’ll be looking for foils of this around $1.50. Descent of Dragons – I know that lots of people have fooled around with this, looking for combos that generate all sorts of advantages, but I’m thinking about how if I already have a bunch of creatures, I should be winning anyway. This is a mana less than Devout Invocation, and that’s a dollar mythic. I think Descent’s price is going to open high on assorted hype and will trickle downward. I won’t be trying to get these until they fall to $5 or lower. 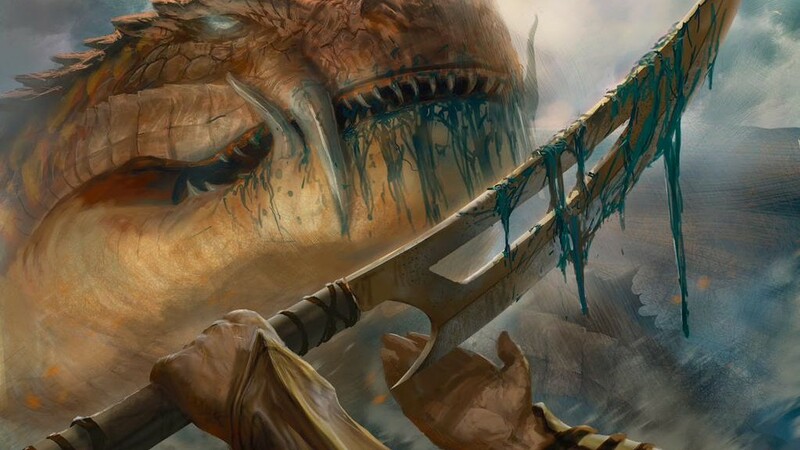 Impact Tremors – If you see someone lay this down on turn two in a Commander game, your target is acquired. This is half of the cost of Purphoros, for half the damage, so you’ll need twice as many tokens to be generated. Very doable. I’ll be watching for foils under $1. Lightning Berserker – This card might be the real deal in mono-red decks. It also might not be. It’s not quite as durable as Monastery Swiftspear, but is there a better late topdeck? Perhaps the question is, would a red deck play this over Crater’s Claws? Some combination thereof? I think it’ll be worth picking these up in trades throughout the draft season, just in case. Rending Volley – This might as well say “Best Sideboard Card Against Twin” on it. Spellskite can’t touch it, and it’s got Combust beaten by a full mana. I’m going to be looking for these around 50-75 cents, and I’m game for $5 foils. This is a very Cube-able card as well. Roast – Yes, the damage can’t hit a flyer, and that’s a big mark against it. But everything else is amazing. Two mana! Who cares if it’s a sorcery, just get in there! Tasigur, Siege Rhino, you name the wingless problem and it’s solved. I feel good about this being about a dollar, and the foils should be around $5. This and Rending Volley might well be some very premium foils if eternal red decks decide it’s worth it. Zurgo – He is who he is. He’s certainly not who he was. Poor guy. Stay away. Assault Formation – Even in foil, I’m not interested. Rolling Stones has been a card for a long time, and neither of its foils can crack $5. Inspiring Call – I meant to add this to last week’s piece, as this is something my Experiment Kraj deck wants very very badly in foil. I expect I’ll pay about $2 for that. All Foil Commands – Be very wary of picking these up without having a specific plan in mind. Some of the multicolor modal cards are very high in foil, some are not. I want a foil Silumgar’s Command, and others will be wanting these in foil, but the key is in their eternal playability. Boros Charm is the best example, but even Golgari Charm is getting good mileage and expensive foils. I’m going to let the metagame sort the commands for me before I move in. Destroy any number of target creatures. For each creature destroyed this way, its controller puts a 4/4 red Dragon creature token with flying onto the battlefield. If a creature is targeted but not destroyed (for example, if it regenerates or has indestructible), it won’t count toward the number of Dragon tokens put onto the battlefield. Well, that makes me look pretty bad and feel pretty silly. I tried to look up this interaction but it seems I was wrong. Editing will commence, and thanks for pointing this out.